Confluence Gallery invites you to come be entranced by the lilting voices of Rumelia, the urban sounds of former Yugoslavia, and the popular music of the modern-day Balkans. Twining their voices in close-harmony duets from the streets of old Tetova and further east into the Black Sea regions of Anatolia and the Caucasus, the Lonely Coast weave a gorgeous musical landscape with shimmering threads of story and song. 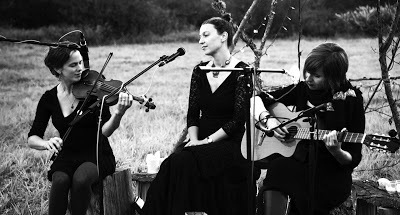 Seattle-based The Lonely Coast (Anne Mathews & Valerie Holt) have performed music from the Balkans and other folk traditions for over a decade. The duo will be joined by fiddle master Annie Ford on violin and voice and versatile Bay Area percussionist Adam Troy on darbouka and davul for a diverse set of love songs, lullabies, and laments. This particular quartet first coalesced three years ago at the Eastern European Folklore Center’s annual Balkan Music and Dance workshops in Mendocino, California. Anne, Valerie, and Annie can also be seen performing in their seven-piece electropop-folk dance band, Eurodanceparty USA. Date: Sep 10, 6:30 pm, doors open at 6:00. COST: $15 in advance or at door. LOCATION: Confluence Gallery, 104 Glover St Twisp, WA. TICKETS/INFO: Confluence Gallery, 509-997-ARTS.